Fair Use of Copyright Material – What Can You Use in Your Book? If you’re writing a non-fiction book, you’re probably quoting other people’s work in your material. Or you’ve used other people’s work as a reference. In many cases, you’re probably interviewing people. Maybe on podcasts or over the phone to create content from that. 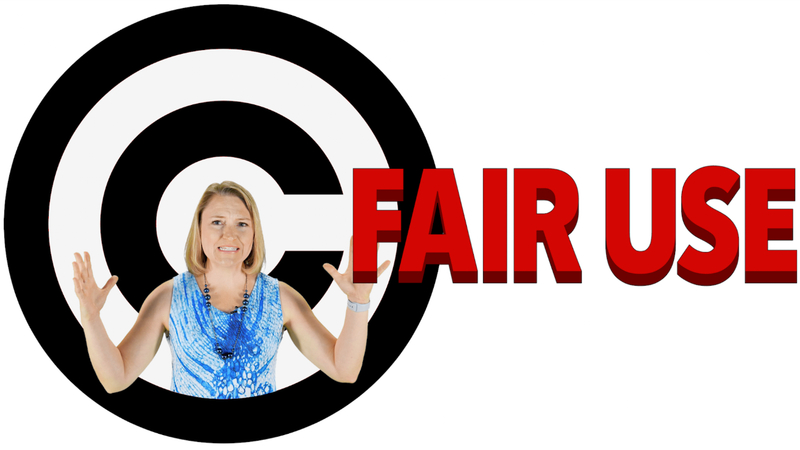 So, what is considered fair use of copyrighted material, and what requires permission? And what is just outright not okay? Fair use is covered under US copyright law. It says that brief excerpts of copyright material may, under certain circumstances, be quoted verbatim for purposes such as criticism, new reporting, teaching, and research. In those cases, you do not need to secure permission from the creator or copyright holder. Fair use protects negative and positive comments and discussion. As an author, we will often refer to other books or works by others because something they wrote or created inspired us, and we want to refer to it or build upon it. That is fair use. But, keep in mind the word brief. There’s no word limit. It comes down to the amount of material used must be reasonable given that purpose. In other words, it’s a judgment call. US copyright law does not require attribution, but how would you feel if someone quoted your words or references your work, but didn’t give you credit? So give your fellow authors a shout out! What about to support your point, which is how a lot of us authors will use copyrighted material? Fair use applies when copyrighted material is being used to illustrate, support, or prove an argument or point. But again, there are some limitations as to what this can cover. You can’t use someone else’s work for decorative purposes. As it pertains to the body of your book work, you’ll need permission to use copyright material for anything but to support your argument, period. It can entertain while supporting your argument, but it’s not just to be for entertainment. It’s also subject to that reasonable amount of reproduction test. One fun fact covered in the Fair Use Guide by the Author’s Alliance is about charts and graphs. Charts, graphs, and tables may be protected by copyright, but the underlying facts are not copyrightable. My interpretation (I’m not a lawyer) is that you can’t copy someone else’s chart or graph and reprint it without permission. But, you can create your own with the facts given. Creative choices in the way those facts are presented in a chart or graph might be original enough to warrant copyright protection of your own. For more copyright protection for your book visit this article. It’s important to note, copyright does not protect ideas, processes, facts, systems, principles, or discoveries. Copyright protects only the expression contained in work. Or find material that’s no longer covered by copyright or the copyright expired. Or, something I often encourage Book Launchers clients to do is to just make up something awesome of your own. Why quote someone else’s research or brilliant ideas, when you can quote your work? 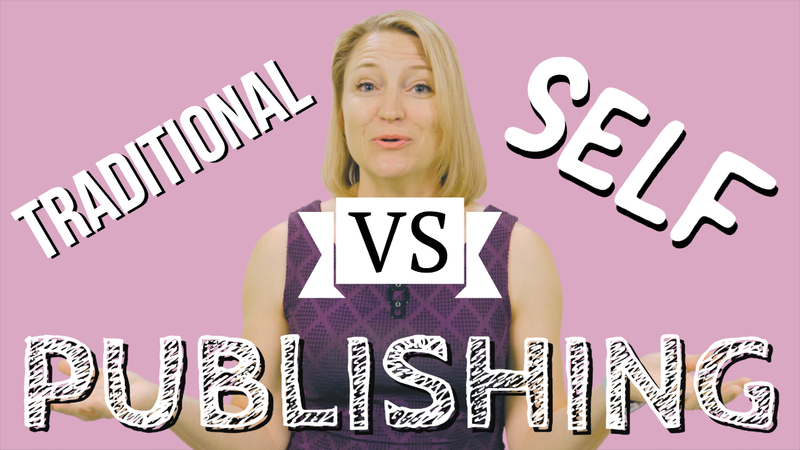 Traditional vs. Self-Publishing – what’s best for you? https://booklaunchers.com/wp-content/uploads/2018/10/Fair-Use-of-Copyrighted-Material-Thumbnail.jpg 720 1280 jabroad https://booklaunchers.com/wp-content/uploads/2017/04/Book-Launchers-Logo-300x212.jpg jabroad2018-10-12 20:31:362018-10-13 21:32:34Fair Use of Copyright Material - What Can You Use in Your Book? You already know the tremendous benefits of writing, publishing, and selling a non-fiction book. It’s a fantastic way to boost your business, grow your income, and get booked on media and stages. But, you’re probably thinking, how do I start writing a non-fiction book? What is the first step? If that’s you, this is for you. Before you start writing a non-fiction book consider what your goal is. If you’re thinking, I want to be a bestseller, then you have to dig deeper and figure out why? This article on why you are probably wasting time chasing Amazon bestseller status is worth a read too. To solidify your position as the authority in the industry and get more media attention? A way to connect with specific influencers and people in your community? Once you figure that out, you can dive into what angle you need to take with the book to achieve that goal. Next, you need to figure out who you are writing the book for. Who is your ideal reader? What problem do they have that you can solve with your book. Bonus points if you know who your reader is so well that you can identify the books they are already reading, the conferences they attend, the podcasts they listen to and who they are influenced by right now. Finally, what is the hook of your book? The hook is the single thread of an idea that ties your entire book together. 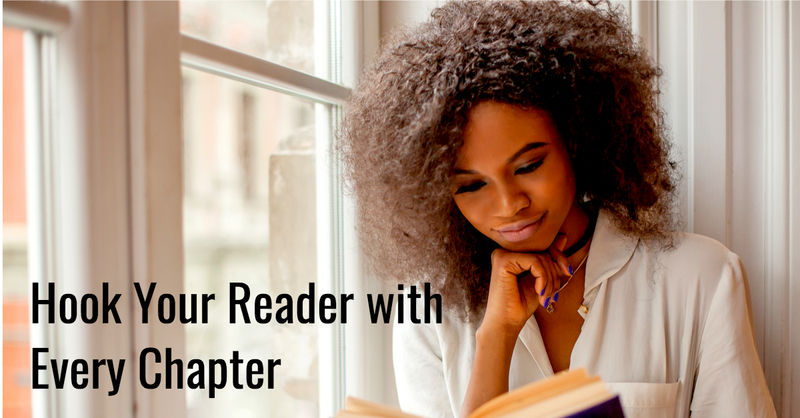 It’s what makes your book different and ‘hooks’ your reader in so they feel like they have to read your book right now. When you talk about your book, the hook is what you’ll say to get someone excited about reading it. It’s kind of like an elevator pitch for your book. Let’s look at some examples of great hooks for books. The 4-Hour Workweek wasn’t really about working four hours a week. 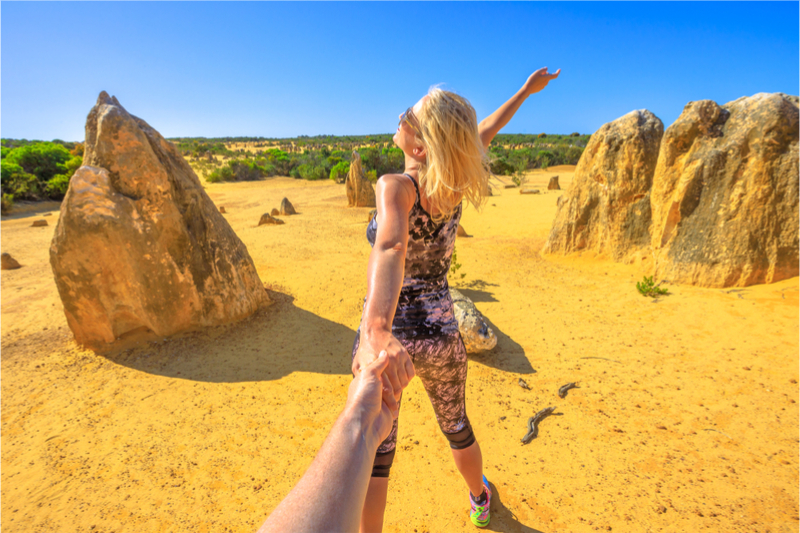 It was a comprehensive game plan to ditch the nine to five from a cubicle and create a business that supports you living an exciting adventure filled life. T. Harv Eker’s, The Millionaire Mind showed how some folks seem to get rich easily while others are destined for a life of financial struggle. The Subtle Art of Not Giving a F*CK shows us how to stop trying to be positive all the time, so that we can truly become better, happier people. So think about a sentence or two that people will use to tell their friends about your book. You can even test it out with your clients and colleagues. If you have something that has your ideal reader going, ooh, I have to read that book, then you’ve probably found your hook. For help figuring it out and getting started writing a non-fiction book – contact us today! We’d love to help you. Grab our 7 Steps to Start Writing a Non-Fiction book or set up a call to speak with us. You don’t think Sarah Palin, Beyonce, Pamela Anderson, Lance Armstrong, and Nicole Richie actually wrote their books? As one celeb said, “I don’t do my own typing.” So many bestselling books were the result of an author hiring a great ghostwriter. Stephen Covey’s 7 Habits of Highly Effective People was written with Ken Shelton. Richard Branson in Losing My Virginity acknowledges Edward Whitley. Howard Schultz’s Onward was penned by Joanne Gordon. 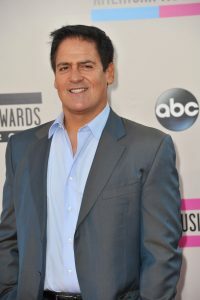 Many of the top-selling CEO and celebrity books are penned by someone else, but the book could not exist without the author. The ghostwriter provides the words, and sometimes some supplemental research, but not the expertise, not the story nor the advice in the pages. That’s all you, the author. 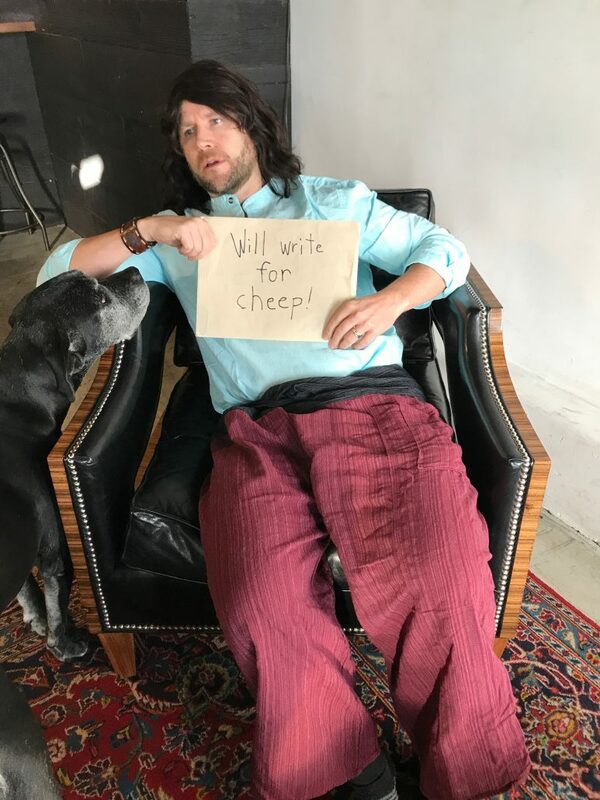 So, if you hate writing, don’t have the time to do it, or you just know you aren’t the best person for the job, a talented ghostwriter could be the right solution for you. A ghostwriter is someone who can write your book, in your words. 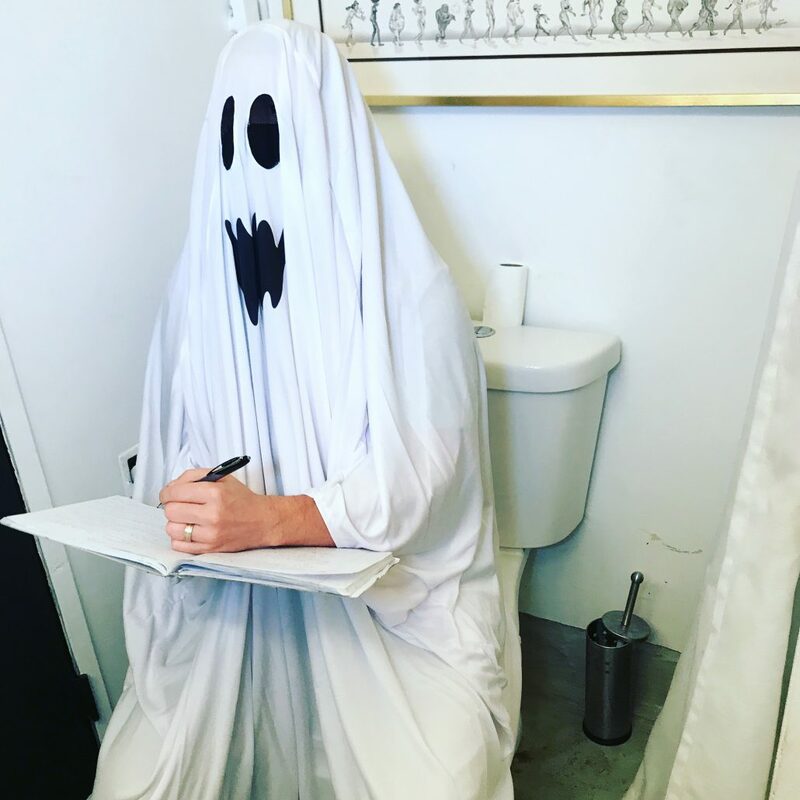 Good ghostwriters work hard to capture your voice to create a first draft. So, what exactly does a great ghostwriter do? First, the ghostwriter needs to flush out the concept for the book. Which means, identifying the ideal reader, and the hook of the book. Working with the author, the ghostwriter will create the outline for the book. Second, the ghostwriter has to get the content from the author. Usually, this involves interviewing the author extensively to capture their voice and expertise. The ghostwriter also will research the subject matter to supplement the content as needed. At some point early on the writer will send a sample over to the author to check the tone of the writing. Then, they will put their head down and their hands to the keyboard and complete the first draft. Finally, the writer then will take feedback on the full first draft from the author and rework the manuscript. Once it’s a solid draft, it’s off the editors, and over to you, to review and revise. If that sounds like exactly what you need help with, your next question probably is where can I find a great ghostwriter? Ghostwriters are everywhere. 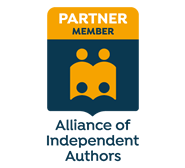 We have several on our team at Book Launchers if you want help with a non-fiction book. But, where do you find the right ghostwriter for you? First, get as clear on your book project as possible. The more you know what you want, the easier it will be to identify a writer who can help you. How much research do you need the ghostwriter to do to add to the manuscript? These are all important things to figure out. Number one, you can ask your friends who have written a book. Number two, check out writing groups on LinkedIn and Facebook. Many of the groups are closed groups, but if you write the admin and let them know what you’re looking for, they just might put up a post on your behalf. When I was hiring a ghostwriter for Book Launchers, I received about 20 highly-qualified applicants from a writers group one of the people on my team is a part of. It was a fantastic source. Number three, Google business ghostwriters. 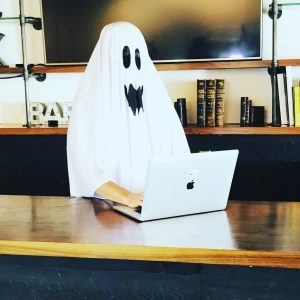 I connected with a few ghostwriting service companies when I was trying to find a very specific, skilled ghostwriter for one of our clients. Four, post a job where you might hire other freelancers, like Guru.com, Upwork.com, Indeed.com or Scriptd. Post a job for a great ghostwriter could result in an overwhelming number of responses though. So, the next question you might ask is: How do you know when you’ve found a good ghostwriter? We’ll cover that in a second, but first let’s explore what it can cost to hire a ghostwriter. My first call was to a ghostwriter I knew would be perfect for him. She’s written at least one Wall Street Journal bestseller. My client loved her, but her price tag of $50,000 to $60,000 was a bit of a budget killer. So I brought in another writer who was a well-respected sports biography ghostwriter. He couldn’t disclose a lot of his clients as many people don’t want you to know that they didn’t write their book. And because I didn’t know his experience level as well, I expected him to be cheaper than the other one. He came in at $1 per finished word. Most business books are somewhere around 50,000 to 75,000 words, so you can see how $1 a finished word could add up. So, I expanded my search and I started interviewing all kinds of people who had ghostwriting experience. Most of the other quotes came in between $25,000 and $35,000 for a book. The cheapest ghostwriter I found, and they were a service, not a single writer, started at $18,000. When you understand that it will take most ghostwriters up to six months to write your book, the prices make sense. Great ghostwriters dedicate a lot of their life and time to this project. They aren’t making a living if they charge much less. And it’s not easy being a great ghostwriter, it’s a skill to be able to write a book well and to do it in someone else’s voice. It’s not just a matter of putting words to the paper; it’s a matter of making sure they would be words that you, the real author of the book, would use. Now, you can hire much cheaper writers. And the writing might even be half decent. The issue is that it’s not your voice and that is so important. It’s not your book if it’s not your voice. And if someone writes in a different style than you would, then you have a mountain of work to do to redo it. Sure, you save money, but you add a whole lot of time, energy and effort to the entire project. Bottom line: to get a skilled professional ghostwriter working on your book, you’re looking at a minimum of 30 cents per finished word. The average cost is going to be closer to 50 cents per word. The more experienced the writer and the more extensive the work you’re asking for them to do, the higher the price. Now, how do you select a great ghostwriter? now it’s time to uncover the secret to screening and choosing the best ghostwriter for your project. 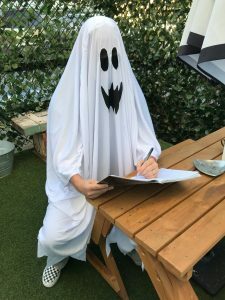 This isn’t as easy as you might think because most people who hire ghostwriters don’t want you to know they didn’t write their book, so this presents a pretty big challenge. How do you evaluate a ghostwriter’s work if they’re not allowed to tell you the books they’ve written? In many cases, the ghostwriter has signed an NDA, so they can’t tell you they wrote that book. 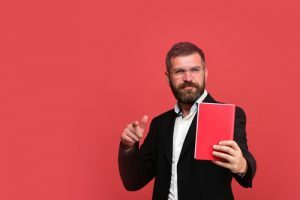 The more experienced ghostwriters will be able to point to a few projects they’ve worked on and can give you samples of their writing, but how do you know if they’ve captured the author’s voice if you don’t get to know who the real author is? Number one, I put something in the job ad that acts as an initial screen. For example, I ask a weird question, like their favorite fruit, or I request that they do not send a resume, but instead send a short writing sample. If they don’t follow that instruction, I immediately eliminate them. If they lack care and attention to detail at the start when they should be showing their best self, it’s not a good sign for me, and it’s an immediate rejection. Number two, I make sure that they’ve worked on similar projects. Have they written several business books before? Not just articles, but full books. Have they written any of their books? Ideally, I want to check out their writing somewhere. Assuming that the writing was decent and they had relevant experience, we’ll move onto number three. Number three, I send them a content editing test. I’ve been using the first five pages of a client’s manuscript. I ask them to read it, provide five suggestions to make it more engaging and easier to read without impacting the author’s voice. Do they recognize the key issues? Can they offer interesting suggestions to improve the material? Are they able to identify questions they should be asking? Number four, I then set up a time to chat. What do you love about writing non-fiction books? I’ve found a lot of ghostwriters who are passionate about fiction, but non-fiction pays their bills. I’m looking for a writer that loves learning new things and turning them into material that will be helpful and easy to digest for someone else. How do you approach a ghostwriting project? There isnt’ a right answer but they need a process. If someone doesn’t have an approach at all, I will be concerned about their true experience level. Finally, how do you prefer to communicate with a client? If everything looks good, references are next. Now, before you hire them for the full project, you still may want to do a tester. Maybe you pay to an article written for you. That way you can see how it is to work with them and if they can capture your voice before you hire them to write your full book. The lower the price, the faster they’re going to need to go to get to a first draft. This isn’t a bad thing, but know that they’re making money on quantity, not quality. You have to manage them, set deadlines, layout expectations and provide feedback. Remember, you’re getting a manuscript, not a book. You still have to hire editors, layout designers, cover creators, and more. Writers won’t give you a satisfaction guarantee because it sets themselves up for a world of pain if they get a picky client. You can set a number of re-writes or revisions in your contract, but it will not be unlimited. It’s your job to manage the process from the start to make sure you get what you want. If all this sounds like a giant pain in the behind, and it is, we can help! We now have writing coaches who help clients to write their book. If you prefer to have an experienced ghostwriter do the writing for you, we can do that, too! The best part is we can do it for less than it would cost if you hired one of these amazing writers on your own. If you want to chat about it, fill out this form and we’ll hop on the phone! Have you thought that? I get it … when I wrote my first book to help real estate investors, I wondered the same thing. My husband and I had been investing for ten years, but we were far from driving Lamborghini’s and vacationing on yachts. We knew several folks who had done more than 100 deals. Two of our friends in Florida had done more than 300 deals! Who were we to write a real estate book? When I started writing, I think we’d done 30 deals, and many of them were problem properties, not profit centers. I didn’t have all the answers, but I did have a perspective that wasn’t being shared that openly in the industry. And, I had the desire to share that perspective to help others. The success of my book (it hit #1 Overall on Amazon as a print book! ), proves it’s not about being the best or having the biggest numbers. In fact, you might be MUCH better suited to write a book than the person who is THE BEST or THE BIGGEST. Here’s why … Who would be best to learn from, someone who is a few miles ahead on the road you’re on, or someone like Elon Musk, Mark Cuban, or Richard Branson? It’s fun to read about their journey, but it’s almost impossible to picture yourself doing what they have done. Most people would rather learn from someone who has unique insights and a different approach to teaching them EXACTLY what they need to know to move forward from where they are today. Someone is going to become famous doing what you do … why not you? Kick those doubts to the curb by taking action. Start writing your book now. Determine the goal of writing a book and set to work on creating an outline. And the most important thing you can do is BE the person who would write the book you want to write. Who You Be Comes First not WHAT YOU DO! If you think you have to do SOMETHING BIG before you write your book, let me share something that changed my approach when I quit my job to start my first business. It’s the reverse to how most of us approach life. Most of us approach our goals with the idea that if we have x, we will do y and be z. For example, I thought: when I have an MBA, I can do a job where I make six figures, and then I will be successful, have freedom and feel financially secure. It doesn’t work that way. In fact, that line of thinking often takes you in the entirely wrong direction – or at least that is what happened to me. So many people think they need to have the perfect story for a book. Then they can write a book, and become the known expert. You DO need to have material for your book, sure. But, if you’re waiting to have something before you do something so you can be someone, it’s never going to happen. Figure out who you want to ‘be’ first. I think it’s about connecting to who you are and letting yourself be that person. That will dictate what you do, and what you have. Consider carefully who you are. That’s where you begin when you set out to write a book, explode your career and become famous for what you do. And of course, you don’t know all the answers. Very few authors will when they set out to write ANY book. That’s part of the amazing benefit of writing a book. You add to your expertise and your network. So … If you don’t have all the answers, who can you interview to help you get the answers? What research can you add to the book to support your experience? What stories can you find to illustrate the message you want to share? BE your fabulous self, DO the work to fill in any gaps you may have and showcase the expertise that will help your ideal reader. Then, you will HAVE massive book writing success. And if you need help – that’s what we do! Let’s chat about your book idea and how we can help you write, publish, and launch your book this year! https://booklaunchers.com/wp-content/uploads/2018/04/shutterstock_1017126028.jpg 533 800 jabroad https://booklaunchers.com/wp-content/uploads/2017/04/Book-Launchers-Logo-300x212.jpg jabroad2018-04-26 22:00:192018-09-20 22:39:25Are You Successful Enough to Write a Book?